Researchers say the finding provides key insights into the forces shaping the dwarf planet. As we reported recently, NASA’s New Horizons space probe is still providing scientists with mountains of new information about the distant dwarf planet, Pluto. 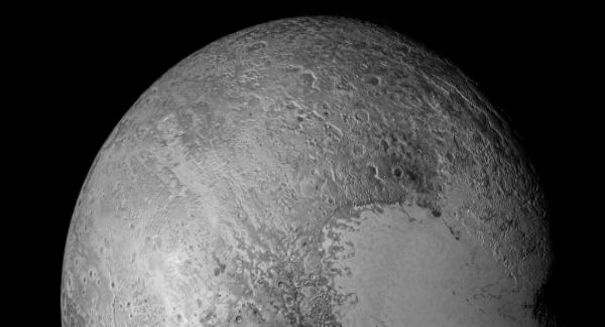 According to a report from Space.com, the most recent image from New Horizons offers a magnificent view of jagged peaks, ice plains and something never before observed on Pluto. The area in the picture is massive – so large that scientists say the viewer can see what ‘twilight’ would look like on Pluto. It was taken as New Horizons zoomed past Pluto last July, coming within a few thousand miles of the strange body. The photo was taken with Pluto positioned between the sun and the craft, providing a rare view into the foreign atmosphere looming over the dwarf planet’s surface. The sunlight bursting through the atmosphere illuminates multiple fascinating landmarks on the surface, including the Norgay Montes mountain range and the sprawling ice plain known as Sputnik Planum. According to a statement from NASA, however, the real news is the massive cloud that can be seen hanging over the jagged peaks on Pluto. Scientists say that it “may be a discrete, low-lying cloud in Pluto’s atmosphere; if so it would be the only one yet identified in New Horizons imagery. “Atmospheric models suggest that methane clouds can occasionally form in Pluto’s atmosphere,” the statement continued. Unlike Earth, the dwarf planet’s atmosphere is made of a combination of nitrogen, methane, and carbon monoxide. The majority of these gases originate from the ice sheets blanketing the surface, which are can also be seen in the photo. The photo was snapped just 19 minutes after New Horizons’ closest approach using the Ralph/Multispectral Visual Imaging Camera at a distance of roughly 13,400 miles. It has a resolution of 1,400 feet per pixel, and provides unique insights into the forces shaping Pluto’s surface and affecting its atmosphere. A NASA press release describing the details of the images can be found here.